A healthy and highly nutritious choice in order to match all sorts of occasions is about to be at your fingertips. An easy preparation of whole wheat veg pizza will definitely prove you as the best cook. Now onwards, you need not go for breaking your bank by purchasing pizza from outside the shop as you can make a better item at your home by your precious hands. 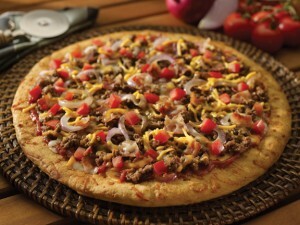 All you need to do is kneading the dough in a well manner so that you may easily fetch a nice and soft textured pizza. Also, assembling the pizza is much easier than it seems. Even you may prepare the required sauce easily in your own home without taking the usage of any preservative. 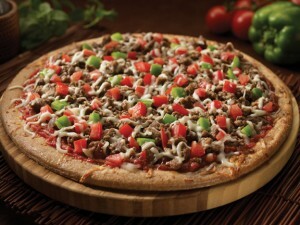 In order to get an idea regarding Garlic Chicken Pizza Versions, you may Try This. After the dough has leavened, it must be divided into parts. Each portion must be needed and kept covered for 15 to 20 minutes. Before assembling, greased 9 to 10 diameter round pan with olive oil. Dusted the pan with some whole wheat flour or cornmeal of semolina. Heated the oven for 20 minutes by preventing the same from getting preheated. Took one portion of dough and dusted the dough lightly with whole wheat flour. Rolled the dough into 8-9 inches diameter in an even manner. Lifted and placed the same gently in the pan. Brushed some olive oil in the dough, followed by spreading of 3-4 tablespoons of pizza sauce in an even manner. Added 3 tablespoons of shredded mozzarella cheese. Sprinkled some red chili flakes and dried oregano. Again topped with shredded mozzarella cheese. Kept the baking tray into the center of the preheated oven and baked till the cheese got melted. After it went baked and golden color, sliced the pizza and served hot.